The above quotes suggest how the most cataclysmic aspects of war often had small beginnings. Small, in the sense that they sometimes depended on the whims of a few individuals. Small, as they involved that most fundamental of phenomena — the chemical molecule. The sites of such developments were more than just laboratories and universities. Their origins were more than likely institutional, the result of various government-sponsored joint ventures and committees entrusted with creating advanced weapon technologies. The most powerful and influential of these was the National Defense Research Committee (NDRC), which came into official existence on July 2, 1940, more than a year before the United States entered World War II. That year, President Roosevelt appointed Carnegie Institute president Vannevar Bush as the NDRC’s first chairman. Original committee members, in addition to representatives of the armed forces and the government, included Roger Adams, head of the Department of Chemistry at the University of Illinois, Karl T. Compton, President of Massachusetts Institute of Technology, James B. Conant, President of Harvard University, F.B. Jewett, President of the National Academy of Sciences, and R. C. Tolman, the Dean of the Graduate School at California Institute of Technology. 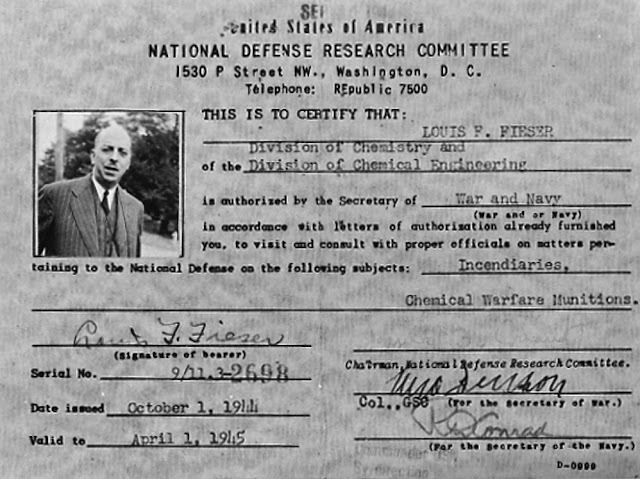 Shortly after his appointment, Bush organized the NDRC into five separate divisions, each entrusted with a general type of weapons research. With Bush’s endorsement, Dr. Conant’s was the first NDRC division to receive funding. This division’s sole charge was the research and development of different types of bombs, fuels, poison gases, and “chemical problems.” Bush immediately contacted a group of professors from universities throughout the country to begin work in this area. On October 23, 1940, the committee members met at Roger Adams’ home and finalized the very mechanisms that would “draft” prominent scientists into the war effort. Participation in the NDRC structure was highly secretive: each member was to receive the highest security clearances and very wide-ranging powers regarding the nature of their research. One of these professors was Harvard University chemist Louis F. Fieser. A widely-published expert on organic and synthetic chemistry and student of James Conant's, Fieser’s job was to evaluate the explosive potential of new types of nitrogen-based compounds. He enlisted a group of other well-known scientists for his cause: Richard C. Clapp, a Harvard-trained chemist working for the Quartermaster Research and Development Center; William H. Daudt, a research scientist at Dow Chemical; William von Doering, a chemistry professor at Yale University; and Marshall Gates, the editor of the Journal of the American Chemical Society. Together, all worked in secrecy in basement laboratories on the Harvard campus. They were a productive group. 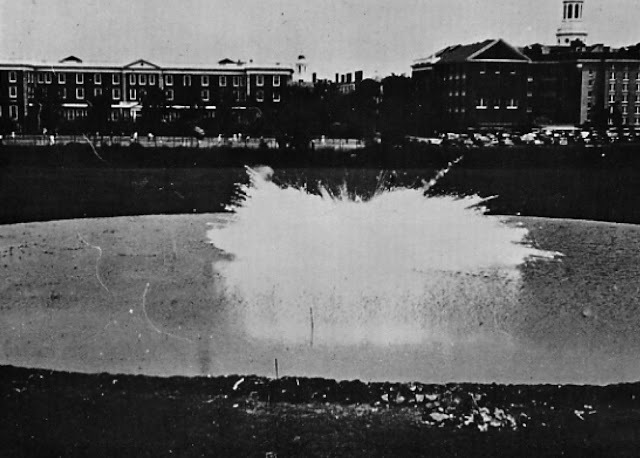 In a matter of time, the team developed two nitrogen compounds that were over 100 times more powerful than TNT, Tetryl, PETN, and Cyclonite, the preferred conventional explosives at the time. Fieser’s group presented the results at an NDRC conference on explosives on May 28, 1941. James Conant was present at this conference, and informed Fieser about an unusual series of events at a DuPont plant in Delaware. A group of DuPont scientists, also under NDRC supervision, reported a series of explosions occurring during the production and testing of divinylacetylene, a synthetic drying oil for paints. These scientists found that exposing the oil to oxygen caused a violent, explosive chemical reaction. Conant asked the conference attendees if any of them would be willing to explore the potential military applications of divinylacetylene. Fieser was the first to volunteer. By the time Fieser and Hershberg reported the results of this test to the NDRC in June 1941, around the time that the Office of Scientific Research and Development (OSRD) assumed all responsibilities over American weapons research, the Royal Air Force and the German Luftwaffe already had months of experience using incendiary bombs against each other’s cities. The R.A.F. began bombing Berlin on August 25, 1940, and Germany responded in kind with attacks on London and other major English centers. It thus may not be surprising the War Ministry, who already had valuable contacts within the NDRC, was interested in Fieser’s bombs. In July 1941, Major Gerrard M. Rambaut of the British Air Ministry paid a visit to Fieser’s and Hershberg’s lab. Major Rambaut was responsible for the testing and development of incendiary bombs in England, and was interested in finding a way to increase the effectiveness of R.A.F. ordnance. 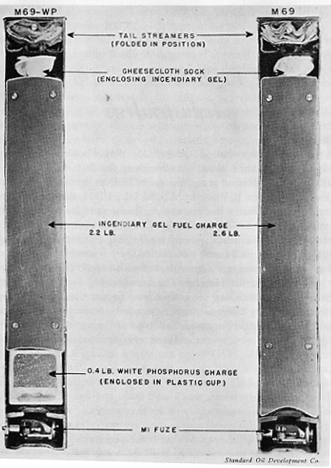 The R.A.F.’s incendiary bombs relied on a mixture of magnesium and phosphorous, a mixture that ignited upon contact with oxygen, but that did not have the ballistic properties of divinylacytelene. A month later, the NDRC was reorganized, and Fieser’s group was assigned the task of developing chemical spray agents. A result of this reorganization was the NDRC’s decision to abandon development of petroleum-based incendiaries in favor of the British-style magnesium incendiary bomb, as well as a type of bomb that relied on a mixture of iron oxide and aluminum to create puddles of molten iron. Fieser, the consummate self-promoter, called Roger Adams at the NDRC and successfully lobbied for additional funds and manpower for the development of gasoline-based incendiaries. The resulting contract between the NDRC and Harvard called for the payment of $359,125 to a project called “Anonymous Research No. 4, OEMsr-179” — thus inaugurating the development and testing of incendiary weapons in the United States. Cut X lbs. Of smoked sheet rubber or Y. lbs of pale crepe rubber into strips and insert these through the opening in the nose of a bomb. Place the bomb upright and run in gasoline until the level is 3 inches from the top (in order to provide a 5% void). Screw in the burster tube securely and rest the bomb on its side. To ensure even mixing, rotate each bomb 180 degrees at three 1-2 hr. intervals. A Japanese submarine torpedoed the ship containing the bomb shipment only a couple of days after the attack on Pearl Harbor. And by early 1942, Japanese forces controlled all the vital sources of rubber in the South Pacific, a circumstance that affected both Allied and Axis weapons research. 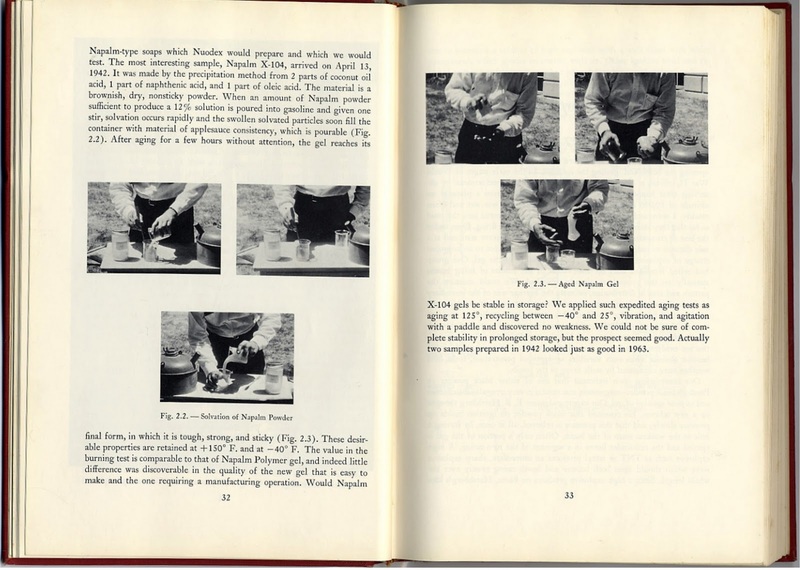 Fieser’s team now faced the task of developing an incendiary bomb that did not rely on rubber for its gelling properties. By this time, the Chemical Warfare Service set up offices on the MIT campus, and began working with Fieser at his Harvard lab. The results of more testing revealed that aluminum naphthene, a metal soap, successfully formed lauric acid gels when mixed with gasoline. And finally, when mixed with another soap, aluminum palmitate (coconut or palm oil), the incendiary bomb finally had the gelling properties that Fieser and his team desired. The new gel could not only withstand temperatures above 90 degrees Fahrenheit, but would still stay in a gelled state in temperatures lower than –30 degrees Fahrenheit — the operational parameters required by the United States Army Air Force for aerial operations. Fieser eventually called the resulting compound napalm, a contraction of the names of the two soaps (napthene palmitate). The performance, from the start, was most impressive. The high explosive cuts the inner well into the ribbons and opens the casing down the entire length. Pieces of phosphorous are driven into the gel, and large, burning globs are distributed evenly over a circular area about 50 yards in diameter. The 6-pound M69, napalm-filled bomb, was the model that made headlines with its spectacular performance in the strategic bombing of Japan. More than 30 million of them were manufactured. Exactly 755,319 clusters of these bombs were dropped on the cities of Japan, each cluster consisting of 14, 38, or 60 of the 6-pound bombs … [T]he attacks on Japanese cities were on so large a scale and such concentrated form that Japanese fire fighting defenses were completely overwhelmed. To have added intimidation would have been gratuitous … Our incendiary attacks destroyed 158 square miles of Japanese industrial areas and left homeless an estimated 8,480,000 persons. Approximately 40 per cent of every city subjected to incendiary bombing was destroyed and because so much of Japanese war industry was in homes, under the typical light housing of the Pacific Islands, the war potential of the nation was seriously crippled. In the decades following World War II, historians have assessed the significance of this campaign of total destruction. The literature has even analyzed the historical exigencies that led United States Army Air Force planners to consider the use of napalm against Japanese cities, conditions that facilitated the switch from “strategic” to “area” bombing. Whatever historical, critical, or analytical lens is chosen to examine the events, it is important to note that incendiary attacks against Japanese cities in 1945 did not distinguish between industry and housing. Japanese civilians and uniformed-personnel were equal in the eyes of the United States Army Air Force. The development of napalm, specifically, the M69 incendiary bomb, obviated the need to consider collateral damage — all damage was now collateral damage. But before the decision to use napalm against enemy cities was ever made, the M69 bomb had to be tested. The only way to test the flammability of a Japanese house was to build a Japanese house. And in order to understand how incendiaries would burn Japanese (and even German) houses, the Chemical Warfare Service relied on the expertise of a handful of well-known architects. As the NDRC mobilized the scientific elite, the Chemical Warfare Service enlisted the design establishment for the war effort. Thomas Pynchon, Gravity's Rainbow (New York: Penguin, 1972), 167. Ernst Jünger, The Glass Bees, Louise Bogan and Elizabeth Mayer, trans. (New York: NYRB Classics, 2000), 113-114. Accomplishments (New York: Reinhold, 1948), 69. To see how this story unfurls, see my two earlier posts on this topic: A Sphinx in Utah's Desert (posted 6 December 2009) and An Ithaca of Sorts (posted 29 June 2010). See also my two published pieces on napalm testing at Dugway Proving Ground, Utah: Enrique Ramirez, "Erich Mendelsohn at War" Perspecta, No. 41, Grand Tour (Cambridge, MIT Press, 2008) and “Fata Morgana” Thresholds No. 33 Form(alisms) (July 2008). Additional material can be found at Charles Sterling Popple, Standard Oil Company (New Jersey) in World War II (New Jersey: Standard Oil Company of New Jersey, 1952). Materials regarding the results of the M69 trials at Dugway Proving Ground are located at the National Archives: ETF 550 E-2844: Military Intelligence Division, Great Britain – “Dropping Trials of Incendiary Bombs against Representative Structures at Dugway, USA, October 12, 1943”, Edgewood Arsenal Technical Files Relating to Foreign Chemical Radiological, and Biological Warfare Retired to the Defense Intelligence Agency for Reference Purposes (Entry 1-B), Records of the Defense Intelligence Agency (Record Group 373), and ETF 550 E-2844: Military Intelligence Division, Great Britain, IBTP/Report/128, “Comparison of the Japanese Targets and Test Results at the Building Research Station, Edgewood Arsenal and Dugway Proving Ground, H.M. Llewellyn, M.A. London”, Report No. R3583-45, June 29, 1945, Edgewood Arsenal Technical Files Relating to Foreign Chemical Radiological, and Biological Warfare Retired to the Defense Intelligence Agency for Reference Purposes (Entry 1-B), Records of the Defense Intelligence Agency (Record Group 373). I loved the article. Very interesting. Thanks for sharing and posting. what a great article, great information..